The Thunder Down Under is our FIRST Robotics Competition team. As part of our responsibility to the local community, Macquarie University started a FIRST Robotics Competition team for students in years 8-12. FIRST is a worldwide organisation which aims to inspire and recognise student achievement and interest in science and technology. The competition relies on mentors from industry and academia to enable the students themselves to design and build real robots from gears, motors, metal, and electronics to meet each year’s FRC challenge. After the summer’s intensive six-week build season, the robot is shipped off to the US for us to compete with other high schoolers from around the world. The competitions take on the air of a football match. Our team, The Thunder Down Under, is focused on helping science, technology, engineering, and maths (STEM) be recognized in Australia as something fun and important. Through various outreach activities and initiatives, TDU is trying to help contribute to solving Australia’s skills shortage. Oh, yeah….and they LOVE building and driving robots! For an exciting look at FIRST, you can go to their website. You may be aware of FIRST LEGO League here in Australia and how its popularity is growing among kids ages 9-14. 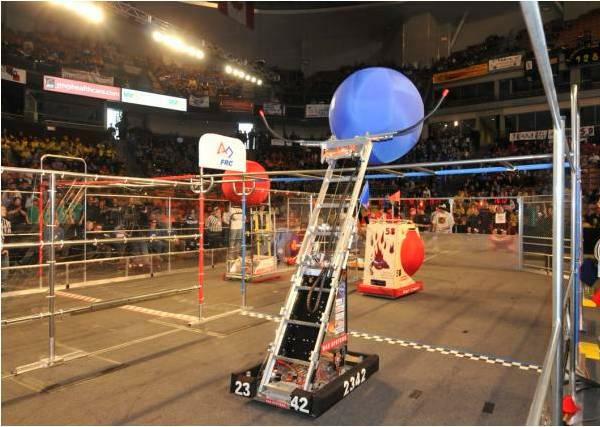 But, unfortunately, Australia has not previously participated with an FRC team. Well all that is changing this fall…. Macquarie University recognizes the gracious donation of Fenix1 (shown here) by Team Phoenix of Nashua, NH USA to help start our FRC team. Fenix1 arrived safely at Macquarie and is available for demonstrations; contact us if you are interested. FIRST participants are ten times more likely to enrol in tertiary study in science, technology, engineering or maths. Combining mechanical engineering, electrical engineering and computer science, robotics deals with the design and construction of robots and their computer systems responsible for sensory feedback and information processing. Learn more about studying robotics at Macquarie. From the day the challenge is announced to when we have to ship the robot is “Build Season” This is normally a very busy, exciting, and intensive time in the life of an FRC team. It normally runs from the second week of January for about 40 days through to the middle of February. The most important thing to know about FRC is that you only come to FRC build season meetings when you can–your family and work commitments ALWAYS come first. If your family has a summer holiday planned, go on the summer holiday. If you have to spend some extra hours at work, make sure you do them well and get the job done properly. FRC is meant to be fun and be part of your life; it should not rule or define your life. These forms should be returned via email (frc@mq.edu.au) or by mailing to A/Prof Michael Heimlich.